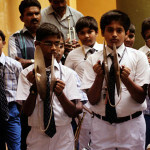 The School follows the CBSE curriculum. The Pre primary section has both the kindergarten and Montessori system of education. Group C – Sociology, Psychology, Economics, History or Political Science. Core English is compulsory for all groups. Physical Education or Fashion Studies or Fine Arts with Graphics offered as additional electives. In addition to these and general studies, work experience, environmental education, Adolescent Education Programme, Physical and Health Education will also be part of the curriculum under internal assessment system. Allotment of groups will be on the basis of performance in the qualifying examinations and entrance tests.